Hormel declined to cooperate with this article, but several of its workers were interviewed here recently with the help of their union, the United Food and Commercial Workers International Union Local 9. Slumped in chairs at the union hall after making 149,950 cans of Spam on the day shift, several workers said they been through boom times before — but nothing like this. 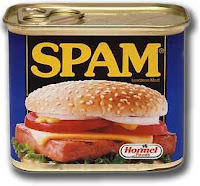 Spam "seems to do well when hard times hit," said Dan Bartel, business agent for the union local. "We'll probably see Spam lines instead of soup lines." The article further reports that Kraft is another company seeing an upswing in the demand for its "low-budget" products, particularly macaroni and Velveeta. Being in a Korean-American neighborhood, spam (and various knock-offs, yes there are knock-offs) is a common commodity/staple (thanks to the GI's in the Korean war). But the hickory-smoked variety is harder to find. This reminds me, though, to stock up. Good earthquake rations.